Last week, science journalists reported on the discovery of a "nearby alien planet" that might be "capable of supporting life." Ross 128b lies approximately 11 light-years from earth and, according to a new study, "is likely a rocky and temperate world" that "could potentially have liquid water on its surface." Ross 128b appears to lie within the "habitable zone" of its star and boasts a surface "equilibrium temperature" of about 70 degrees Fahrenheit. Reports involving planets like Ross 128b typically ignite the imagination of ET enthusiasts and science fiction writers, but should this latest discovery provide real hope that we aren't alone in the universe? There are very good reasons to believe no other intelligent life exists in the universe, despite the vast number of stars and planetary systems. In 1961, astronomer Frank Drake established an equation which may explain why we haven't yet detected intelligent alien life in the universe. His equation (N=R*•fp•ne•fl•fi•fc•L) multiplies the rate at which stars are formed in our galaxy, by the smaller number that are orbited by planets, by the tiny fraction of planets that could sustain life, by the few that might potentially support intelligent life, by the even fewer number of civilizations that could exist long enough to build technology, by the length of time such a civilization would spend sending signals (or traveling) into space. You don't have to be a scientist to recognize what this equation says about the likelihood of finding intelligent life in the universe. If any one of these variables is zero, there is no chance there is any intelligent life in the universe other than our own. 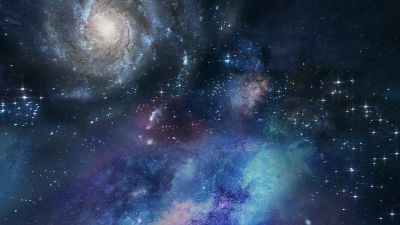 Unsurprisingly, the slim odds of finding extraterrestrial intelligence was affirmed when a new study was published this month examining Drake's equation in light of the latest data available for each variable. According to the researchers, there's a 53% to 99.6% chance that we are the only intelligent life in the galaxy and a 39% to 85% chance we're the only intelligent beings in the observable universe. Anders Sandberg, one of the scientists behind the new research, has been quoted as saying, "There is a pretty decent chance we are alone, given what we know, even if we are very optimistic about alien intelligence." Why are the odds so small? Because the requirements for life on any planet in the universe are extraordinarily high. As I describe in God's Crime Scene: A Cold-Case Detective Examines the Evidence for a Divinely Created Universe, our planet happens to be positioned at just the right distance from the sun, tilted at just the right angle, and rotating at just the right speed. We have an atmosphere that is also just right: favorable to life and held in place by a gravitational force strong enough to maintain its composition. Our planet also happens to have a terrestrial crust that is just thin enough to allow the right amount of oxygen while thick enough to prevent pervasive earthquakes. This crust contains all the right "life-permitting" elements – including something surprising: phosphate. In a study published in April, two Cardiff university astronomers acknowledged the presence of phosphate on our planet may be the reason we are the only planet capable of supporting intelligent life. According to these researchers, phosphate is one of the rarest inorganic chemicals in the universe. That's important, because without adequate phosphate, life cannot emerge on a planet, even if the planet in question, like Ross 128b, is similar to earth in other ways. The Cardiff scientists were astonished to find that phosphate is largely absent in the universe and even more surprised to find it is so abundant here on our planet. Earth appears to be unique. One might even say uniquely designed. One thing is certain: while the number of planets in the universe may be large, the odds against any of them possessing the vitally fine-tuned characteristics I describe in God's Crime Scene (including the presence of phosphate) is larger. That's why we're probably alone in the universe, despite the latest planet discovery. J. Warner Wallace is a Cold-Case Detective, Senior Fellow at the Colson Center for Christian Worldview, Adj. Professor of Apologetics at Biola University, and the author of Cold-Case Christianity, God's Crime Scene, and Forensic Faith.